I love shooting detail shots. I must say, it's especially fun when you get the chance to incorporate things from the venue. 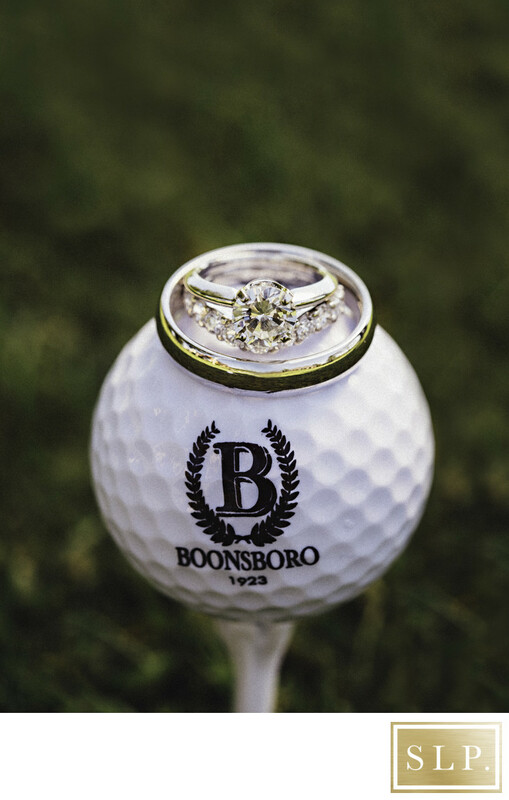 These rings are perfect on top of this Boonsboro Country Club golf ball and tee. It's such an honor to be asked to photograph someone's wedding and I truly take pride in capturing all aspects of the day. I love seeing all the different engagement rings and wedding bands. I used my amazing Sigma 105mm macro for this shot. We shot it right outside on the grounds in front of the club. When I get to weddings, I usually will grab up all the detail shot items and go off around the venue and shoot them. I love finding new, unique ways to shoot details. I feel like it is something that sets me apart from other photographers. What's most important is that the photos represent something for my couples. Being that Tara worked at Boonsboro for many years and Zach loves golf, this was a win win for me. I enjoy seeing the story of my couple's wedding come to life again in the images of their big day. I look forward to many more amazing ring shots each wedding day! Location: 1709 BCC Dr., Lynchburg, VA 24503.